In 2005 and 2006, CCR completed cultural resources studies for VDOT’s Route 460 Location Study, which addressed improvements or relocation of approximately 52 miles of Route 460 between Petersburg and Suffolk, conducted seven major tasks for the cultural resources portion of the study, including a cultural resources overview of the area, historic architectural studies, an archaeological assessment of the three studied corridor options, an intensive archaeological survey of the preferred alternative, the evaluation of selected archaeological sites and historic resources identified within the preferred alternative. The archaeological assessment, which examined three study corridor locations, included an extensive historic context and addressed the potential for sites meriting in-place preservation or costly/complex mitigation. This assessment included consultation with the National Park Service staff regarding potential Civil War battlefield sites. During the historic architectural study, over 190 historic structures were identified, 26 of which were selected for further evaluation for NRHP eligibility. These evaluations included the examination of the alignment of the historic Norfolk and Petersburg Railroad. CCR’s identification survey covered a portion of the interior Coastal Plain involving a 27.8-mile-long corridor between I-295 in Prince George County and Route 628 in Sussex County. 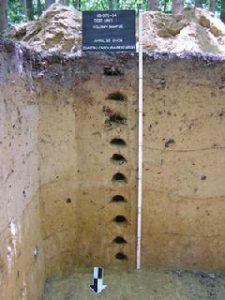 Due to the proximity of the Cactus Hill Site (44SX0202), the possibility of both buried upland sites and buried floodplain or terrace sites was anticipated and shovel tests often extended to a depth of approximately 80-100 cm below surface. The survey resulted in the identification of 2 previously recorded sites, 60 previously unrecorded sites, and 29 artifact locations. Twenty of the sites were recommended as potentially eligibly for the NRHP, some of which were located within deep alluvial or aeolian deposits. The evaluated archaeological sites included 10 Native American sites, 4 historic sites, and 6 sites containing a Native American and a historic component. The Native American sites consisted of lithic and/or ceramic material and ranged in date from the Early Archaic to the Early/Middle Woodland period. 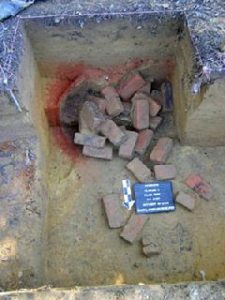 The historic sites consisted of domestic artifacts ranging in date from the eighteenth, nineteenth, and twentieth centuries, a possible nineteenth-century tar kiln, a late nineteenth- to early twentieth century cemetery, and a possible civil war earthwork. As a result of the evaluation excavations, five of the sites were recommended as eligible for the NRHP.